Chang'e 3 (simplified Chinese: 嫦娥三号; traditional Chinese: 嫦娥三號; pinyin: Cháng'é sān hào) is an unmanned lunar exploration mission operated by the China National Space Administration (CNSA), incorporating a robotic lander and China's first lunar rover. It was launched in December 2013 as part of the second phase of the Chinese Lunar Exploration Program. The mission's chief commander was Ma Xingrui. The spacecraft was named after Chang'e, the goddess of the Moon in Chinese mythology, and is a follow-up to the Chang'e 1 and Chang'e 2 lunar orbiters. 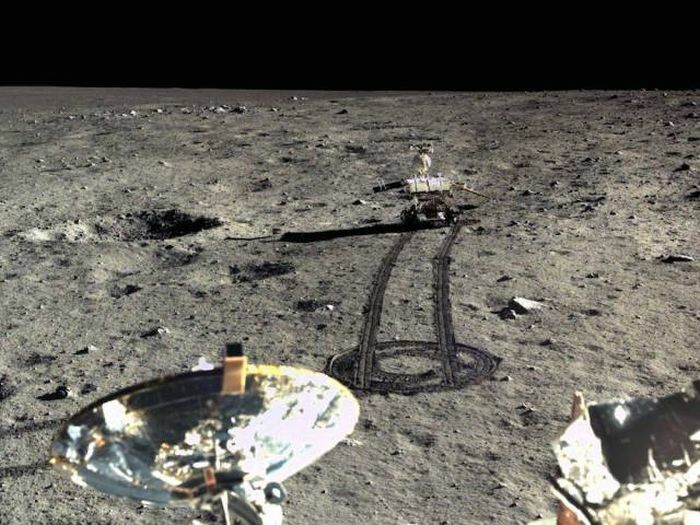 The rover was named Yutu (Chinese: 玉兔; literally: "Jade Rabbit") following an online poll, after the mythological rabbit that lives on the Moon as a pet of the Moon goddess. Chang'e 3 achieved lunar orbit on 6 December 2013 and landed on 14 December 2013, becoming the first spacecraft to soft-land on the Moon since the Soviet Union's Luna 24 in 1976. On 28 December 2015, the discovery by Chang'e 3 of a new type of basaltic rock, rich in ilmenite, a black mineral, was reported.